Many people around us misunderstand the Christian faith, and we might be the only ones who will ever show them the truth. That’s why Ligonier Ministries has a special resource for you this month: the full 32-part series Defending Your Faith on DVD and a DVD-ROM featuring the audio version of the series and a study guide. This resource is yours when you give a gift of any amount to Ligonier Ministries. I believe resources like Defending Your Faith are especially suited for such a time as this. As we’ve seen the reaction of the culture to Christians in light of the recent gay marriage decision and the uproar over the video exposés about Planned Parenthood, I’ve been coming back to these words: Whatever the nature of their creed, stubbornness and inflexible obstinacy surely deserve to be punished. Those words aren’t from a current judge who wants to force Christian bakers, florists, or photographers to perform their services for the “wedding” of two men or two women. They’re much older. Pliny the Younger, a second-century Roman governor, wrote that statement to the emperor when he was dealing with Christians for not bowing to the demands of the state. Rome saw believers as enemies of mankind—“haters,” if you will—simply because they wouldn’t agree with everything society said was true. Pliny’s words remind us that from the beginning, God’s people have been misunderstood and accused of hatred and bigotry. Such accusations put us in a long line of godly men and women who have suffered for Christ. These believers loved their enemies and made an articulate case for Christianity. That’s how we must respond today. Our noble calling is to gently and respectfully give an answer for our hope (1 Peter 3:15). Ligonier Ministries assists believers in giving this answer. We proclaim the reasons for our faith through the Renewing Your Mind teaching program, RefNet, Tabletalk magazine, Ligonier Connect, Reformation Trust books, and other outreaches. We seek to do this without dumbing down the Christian faith or speaking over the heads of our neighbors. Only by proclaiming the truths of Christianity in an understandable way will we reach the culture. And our donor-supported outreach is enabled by gifts of any amount from friends like you. 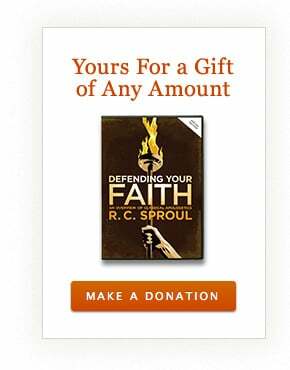 Your gift of any amount this month will further this mission and you will receive the complete Defending Your Faith teaching series as our thank you. Will you join with us to equip Christians to defend their faith? Note: Offer expires 9/30/2015. Please allow up to 6 weeks for delivery after your gift is processed. Contributions are tax-deductible as allowed by law. For federal income tax purposes, the deductible portion of your charitable contribution is limited to the excess of the money contributed over the value of the goods provided. Our good faith estimate of the value of these resources is $12. Offer valid in U.S. and Canada only. Thank you for your support.